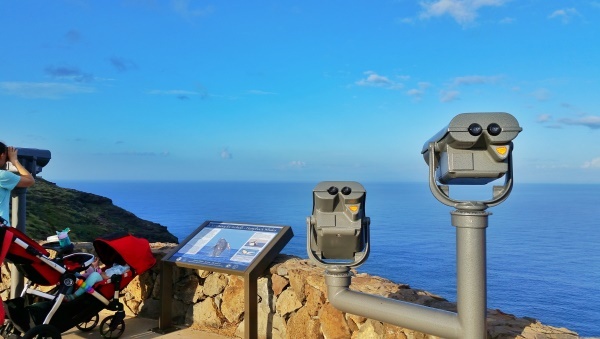 Makapuu Lighthouse Trail :: Best views for whale watching :: oahu hawaii. oahu hikes. So if you’re looking for a day away from Waikiki Beach, have a look to the southeastern side of Oahu! 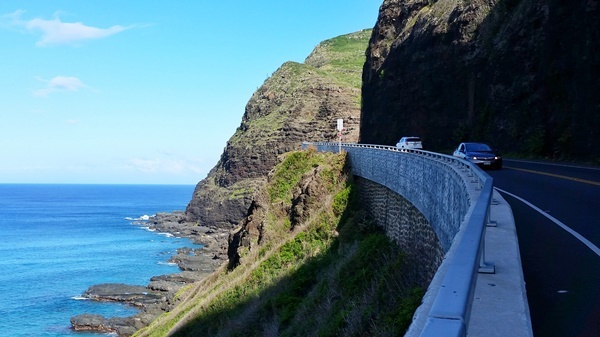 A visit to this side of the island will likely end up being a memorable part of your visit to Hawaii. 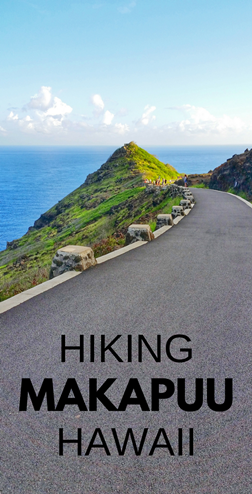 You have a number of hiking trails on Oahu to choose from around the island, and you just may want to consider the Makapuu Point Lighthouse Trail. This isn’t a dirt hiking trail, but rather a paved path. It comes with stunning views! 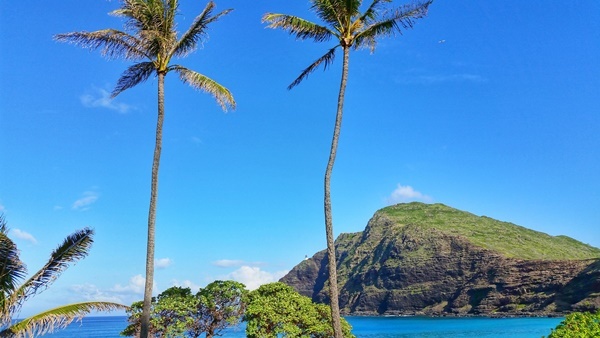 There is no entry fee, so it’s one of the free things to do on Oahu! 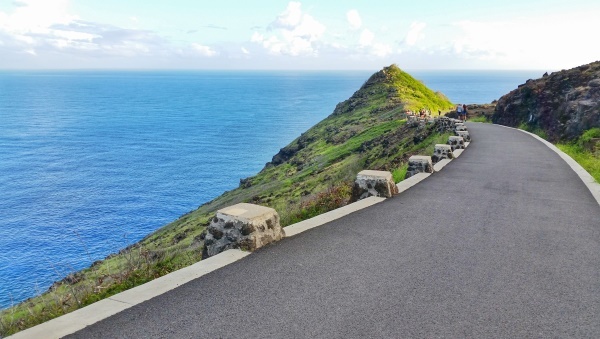 Now, here are a few things about the Makapuu Lighthouse Trail. The Kaiwi Shoreline Trail is designated as a state scenic shoreline by the State of Hawaii. Basically, there are two paths that you can take when you’re at the trailhead of the Makapuu Lighthouse Trail. One path will take you on the main paved trail in the direction that almost everyone goes. The other path will take you to see another part of the scenic shoreline. In this picture above, the narrow path that veers off to the left is the less walked path. 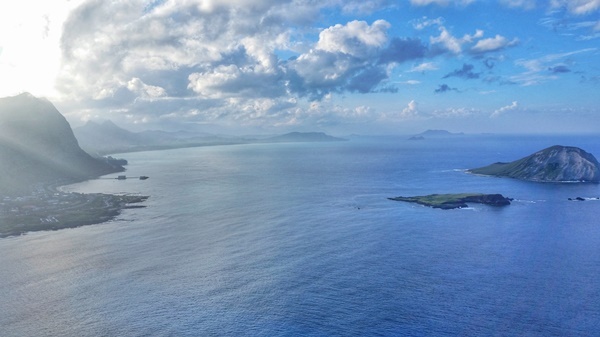 There is no shortage of scenic views! 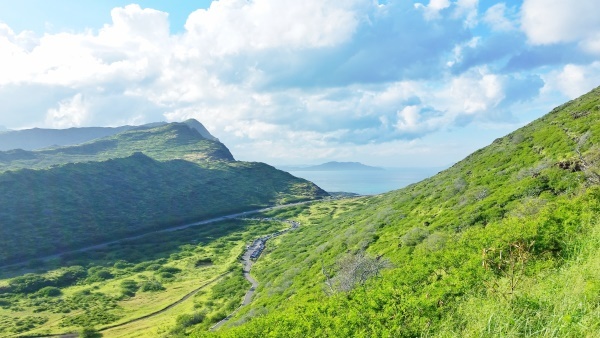 But you can view the Makapuu Lighthouse from above when on the trail! If you’re in Hawaii during the winter months when it’s whale season in Oahu, there’s another incentive for you to go on this trail! 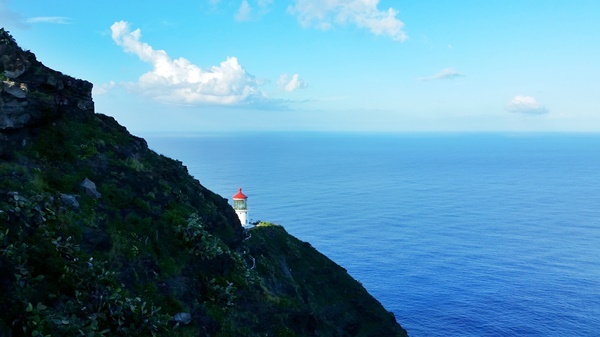 The Makapuu Lighthouse Trail is known as having a good potential for whale sightings. There are binoculars along the trail so you can test your luck! Or, you can pack along your own binoculars! These binoculars can work out well for whale watching. 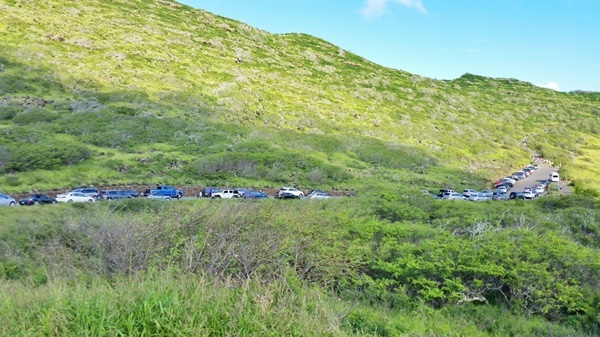 The nearest bus stop to the start of the Makapuu Lighthouse Trail is about a 15 minute walk. There really isn’t a notable sidewalk, which means that you’ll be walking on the side of the road with cars zooming past you. So be careful! But it is a scenic walk! Makapuu Beach is known to be good for boogie boarding. When you’re in the beach area, you can also get a different perspective of the Makapuu Lighthouse! See the white dot in between the palm trees?! That’s the Makapuu Lighthouse! It’s an out and back trail, so around 2 miles round trip. On the out, it’s pretty much uphill the whole way. And you’re rewarded with views! MAKE SURE YOU BRING WATER! It can get hot in Hawaii so you want to make sure that you stay well-hydrated, especially since you’ll be hiking up a hill! For any hike in Hawaii, even if you’re going to be on the trail for less than an hour, it’s always a very good idea to take water to make sure you stay SAFE! And for the Makapuu Lighthouse Trail, you will likely be on the trail for more than an hour, so this means that you should really consider bringing along water! And here are some small backpacks to take a look at to pack along water and those extra snacks. Because snacks are also a very good idea when you’re hitting the trails in Hawaii. HAPPY MAKAPUU LIGHTHOUSE TRAIL HIKING!